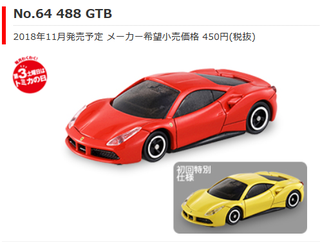 Tomica have now officially announced the Ferrari 488 GTB as a November release. Good luck getting a yellow one! And the new Tomica Premium RS line is now official too. 1/43 scale models with opening parts (Yay!). And as previously mentioned, the first one will be Lamborghini Countach LP500S. But why no pop up lights? And now back to the Porsches.